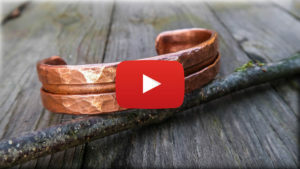 Making bracelets out of copper pipe is super fast and easy! Not many tools are needed at all, I am sure these can be made with just vise, hammer and blowtorch. Copper is a very soft metal that, if annealed, it can be bent into shape quiet easily even cold. It is also very easy to anneal just by heating it up with a blowtoch, and can also be quenched in water still hot because it does not harden by quenching. But still, it will hardens after you shape it for a while (work hardening) so just anneal every time it stiffens up and gets hard to bend. Let me know what you think about this kind of easier project!